What would cause people to hallucinate that way, and so intensely for so short a time? It was just another after-work happy-hour bar downtown, where business professionals unwound with a few drinks, complained about the boss, maybe hooked up with someone for the night. Until something went terribly wrong. At first it was just a friction in the air. The noise intensified. The crowd seemed oppressive. Some sharp words were exchanged, some pushing and shoving. Then the madness descended. And after 12 minutes of chaos and violence, 80 people lay dead. Eve Dallas is trying to sort out the inexplicable events. Surviving witnesses talk about seeing things - monsters and swarms of bees. They describe sudden, overwhelming feelings of fear and rage and paranoia. When forensics makes its report, the mass delusions make more sense: it appears the bar patrons were exposed to a cocktail of chemicals and illegal drugs that could drive people into temporary insanity - if not kill them outright. 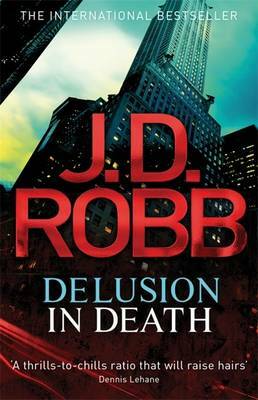 Source: Info in the About Delusion In Death was taken from http://www.audible.co.uk/pd?asin=B0091I3K2M on 26/09/2012.